a major scam has been exposed in a venture aimed at accelerating the economic growth of farmers of the Ladakh region. 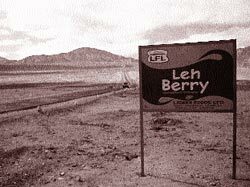 The case involves two former top officials of the Ladakh Food Limited (lfl), which manufactures the popular Leh Berry brand of seabuckthorn nectar. The father-son duo of D K Mittal and Varun Kumar Mittal, lfl's former chairman and managing director, respectively, have been charged with misappropriating funds to the tune of Rs 3 crore in a suit that has come up in the district court. They have also been accused of presenting a fictitious list of shareholders to get loans, grants and equities for personal gains. The police registered a case of forgery against the duo on the basis of accusation made by Ghulam Abbass Abidi, executive councillor in charge of health in the Ladakh Autonomous Hill Development Council (lahdc). Abidi's name was in the fabricated list of 396 shareholders that includes names of 300 farmers too. "I never saw Mittal, leave aside having any dealings with him," Abidi avers. lfl's board of directors, chaired by the managing director, Small Farmers Agri-Business Consortium (sfac) of the ministry of agriculture, removed the Mittals from their posts on noticing the fraud. The duo, however, allegedly continued working illegally. But lfl's new management, with Anand Prakash as its managing director, has charged the promoters acting through Mittals with embezzling funds meant for farmers. The board of directors has written a letter to member of parliament, Thupstan Chhewang, in this regard. It says the Mittals siphoned away profits, equities and grants from sfac, National Agricultural Cooperative Marketing Federation of India Limited and the ministry of food processing industry and loans from Exim Bank and icici Bank to the tune of Rs 3 crore. It was sfac that decided to set up the fruit processing plant at Phyang in Leh to tap the economic potential of the wild seabuckthorn fruit. lfl, a public limited company established in 2002, was short-listed as a promoter and the plant was established under a Joint Venture Agreement. Chhewang, the then chairman of lahdc, was appointed the ex-officio chairman of lfl's board of directors. Meanwhile, it is alleged that the formation of lfl has led to overexploitation of the seabuckthorn plant. Besides, farmers receive a very small portion of the profits made. It has also caused heavy losses to the Indus Tsestalulu Society, a group of local women who first started producing seabuckthorn juice under the label of Tsestalulu juice (local name for the berry), sold locally.